On April 8, Hon. 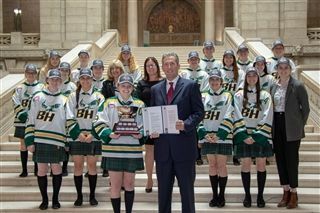 Heather Stefanson (Class of 1988) delivered a speech to Manitoba's Legislative Assembly recognizing the Balmoral Hall Blazers on the 2019 Junior Women's Hockey League (JWHL) Championship. Her Member's Statement concluded with a standing ovation from her fellow Members. The pride felt in that moment is second only to that felt when Kennesha Miswaggon scored the game-winning goal in overtime against NAHA on March 11. Certainly, it was a joyous occasion for the Blazers, who also had their photo taken with Hon. Brian Pallister, Premier of Manitoba, on the Legislative Building's grand staircase. We are grateful to all who made this possible, including, first and foremost, Hon. Heather Stefanson and her staff, Hon. Cathy Cox, Minister of Sport, Culture and Heritage, Head of School Joanne Kamins, Middle & Senior School Principal Jodi Hafenbrak, Executive Director Tina Alto, and Director of Hockey Sarah Zacharias '08. A special thank you to Ms Bonnie Staples-Lyon for coordinating with staff and parents.